Often when a modern film invokes a retro aesthetic, there is a tendency to overstate the look of the past. Sometimes this is intentional and used satirically, and sometimes it’s simply all of the most recognizable elements of an era being thrown onto the screen at once. The trick is, that a time period with a pronounced look doesn’t feel unusual at the time, it’s just part of the milieu of then modern sensibilities. I find it a more interesting use of retro styling when it is used to create a sense of timelessness. The film may have a particularly dated look, but there are anachronisms that create a sense of distance and unfamiliarity. The strange mix of technology in It Follows (2014) is an excellent example. How the Sky will Melt uses the low resolution flavor of the late 1970s/early 1980s to place an ambiguous story in an equally ambiguous time and place. Gwen (Sara Lynch) has returned to hometown following the death of a bandmate. Her band is popular enough that she finds herself avoiding any publicity while encountering a few jealous friends that she had left behind. In a malaise she finds herself aimless as she pilfers the hills near the beach for strange colorful eggs that have hallucinogenic qualities. As Gwen’s paranoia begins into to grow, her friend, London (Scott Alonzo) watches a figure fall to earth. The being, which is neither alive nor dead is seemingly inert, but soon it awakens, straining Gwen’s already fragile reality. Shot on Super 8 and released on VHS, How the Sky Will Melt evokes the soft dream like nature of catching something on late night television while half-asleep. The look of it evokes the techno doom of Idaho Transfer (1973), or Where Have All the People Gone? (1974). 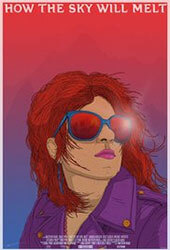 At same time there is an early New Wave vibe that feels akin to Liquid Sky (1982). That is not to say How the Sky Will Melt is a simple pastiche, it is very much interested in telling its own wandering nightmare of a story. "What? Do I have something on my face?" The narrative of the film is very reluctant to straight out explain anything, it forces the viewer to try and pry each moment open and see what’s lurking between the sparse dialogue. Thankfully, the movie also plays fair, it does answer most of the questions it raises. The things it leaves open are even stranger and more terrifying because of it. I did not expect the movie to dip into horror the way it does, but it works very well as the growing knot of tension at the heart of everything. The acting is often amateurish, but the strange line deliveries often help the weird aura of the film rather than harm it. Occasionally the low tech production is a little too rough with muddy dark scenes and strange edits, but these are small flaws in a really engrossing larger work. 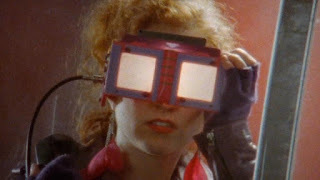 Aesthetically, and narratively strange, How the Sky Will Melt is a fascinatingly odd experience and one I would definitely recommend both as a standalone film and an example of how the medium of VHS can have merit in and of itself.